Febrile seizures (FSs) are one of the most common neurological illnesses in children aged 6 months to 5 years, with a cumulative incidence between 2% and 8%, depending on geographical and cultural factors. Pathological mechanism that triggers FS is still not clear. FS pathophysiology is difficult to study because it mostly occurs at home, so there is access to only postictal data and physiological changes occurring during that period are missed. Although a number of susceptibility genes and environmental factors have been identified, precise mechanism that triggers FS is still unclear. However, it is known that pH changes have central role in the control of electrical activity in brain, leading to seizures. Brain alkalosis is known to enhance neuronal excitability and promote epileptiform activity. Hyperventilation is a standard method to provoke absence seizures, supporting this hypothesis. Also, neuronal activity is strongly suppressed by various maneuvers that lead to decrease in brain pH., Using an animal model of experimental FSs, it has been shown that hyperthermia causes respiratory alkalosis triggers seizures. Moreover, these experimental FSs were completely and rapidly abolished by exposing the rat pups to 5% CO2 in the air, suggesting a putative therapeutic regimen. There is paucity of data showing similar acid–base changes in human. This study was conducted to bring out any association of fever-induced respiratory alkalosis and induction of FS. This observational study was conducted at Dr. Ram Manohar Lohia Hospital and Post Graduate Institute of Medical Education and Research, New Delhi, India. Cases were enrolled after written informed consent were obtained from parents from November 2014 to March 2016. Study was approved by the institutional ethics committee. With reference to previous study, it was found that PCO2 in patients with FS was 29.28±7.30mm Hg (mean ± standard deviation [SD]). Considering the same, sample size of 45 was calculated based on precision (allowable margin of error) of 30% of SD, at two-sided alpha of 0.05. Children were enrolled after fulfilling predetermined inclusion and exclusion criteria. Children aged 6 months to 5 years with seizures in a setting of fever (temperature >37.8°C) not caused by meningitis, encephalitis, or any other illness affecting the brain, who are otherwise neurologically healthy with a normal neurological examination were included and those who presented 24h after the onset of FS or on subsequent investigation found to be a case of meningitis were excluded. Children with lower respiratory tract infection were excluded as the results of blood gas analysis might be affected. Samples were drawn from brachial vein in heparinized insulin syringe as soon as a child presented to emergency, taking all aseptic precautions and immediately transferred to laboratory on ice boxes. 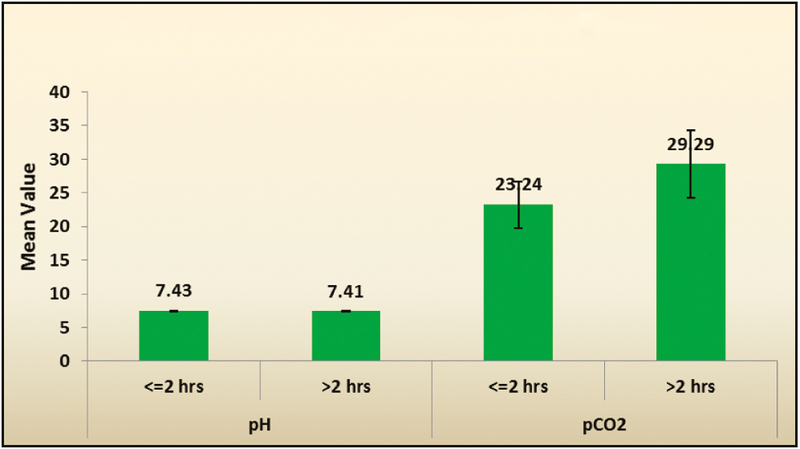 The level of blood gases (pCO2) and pH was measured using Nova Biomedical pHOx plus L blood gas analyzer. Results were compared with standard values: pH, 7.35–7.45; pCO2, 35–45mm Hg; and base excess –2 to +2. Axillary temperature was measured using a digital thermometer and the mean of two readings was taken. Patient characteristics such as age, gender, seizure type, degree, and duration of fever and seizures were also documented. Descriptive statistics was analyzed with Statistical Package for the Social Sciences (SPSS), Inc. Version 17.0. Chicago. Continuous variables were presented as mean ± SD and categorical variables as frequencies and percentages. The Pearson’s chi-square test or Fisher’s exact test was used to determine the relationship between two categorical variables, whereas Student’s t test was applied for continuous variables. P value <0.05 was considered statistically significant. Of 45 enrolled children, 29 were boys and 16 girls. The mean age of presentation was 22.87±12.98 months and 77% of children were between 1–3 years. Approximately 84.4% were simple FS and remaining 15.6% were complex FS (including febrile status epilepticus). None of these children had a family history of epilepsy or FS. Average axillary temperature was 37.8°C with a range of 36.6°C–39.4°C. Majority (71.1%) of cases were attributed to upper respiratory tract infections and the rest were due to acute gastroenteritis, urinary tract infections, otitis media, and enteric fever. Venous blood gas analyses showed a mean pH of 7.41±0.04 and a mean pCO2 of 27.95±5.31mm Hg. The median pCO2 was 26.80mm Hg as shown in [Table 1]. To gain more insights of this association, we divided case into two groups depending on the time of presentation to hospital after seizure (≤2h, n = 10 and >2h, n = 35) as shown in [Figure 1]. The samples drawn within 2h of seizure had a mean pCO2 of 23.24±3.44mm Hg and those samples drawn after 2h of seizure had a mean pH of 29.29±4.99mm Hg. The pCO2 for the samples drawn in ≤2h was lower than those drawn after 2h and the difference was found to be statistically significant (P = 0. 001). [Table 2] shows the relationship between changes in blood gases with change in skin temperature. In children with axillary temperatures recorded to be between 36.6°C and 37.7°C, the mean pCO2 was 28.87±6.14mm Hg; in children with axillary temperatures recorded to be between 37.8°C and 38.8°C, the mean pCO2 was 26.15±3.37mm Hg; and in children with axillary temperatures recorded to be >38.8°C, the mean pCO2 was 31.30±3.82mm Hg. No statistically significant difference was found in pCO2 with rising temperatures. We also compared children with simple FS and complex FS. No significant difference was found in either body temperature or pCO2 level between these two groups. Fever is a direct cause of tachypnea in children. O’Dempsey et al. measured a 3.7 breath per minute increase for every 1°C increase in body temperature in a large cohort of children. This rapid breathing leads to washout of CO2 (hypocapnia), which in turn leads to respiratory alkalosis followed by brain alkalosis. Alkalosis is a known trigger of seizures. We found that 91% of children had hypocapnia after FS. Cause of normal pCO2 levels after FS in remaining 9% may be attributed to delay in bringing the child to hospital and thus delay in blood gas analysis. However, alkalosis (pH >7.45) observed in only 20% of children can also be attributed to delay in bringing the child to hospital and also to the fact that pH will normalize earlier than pCO2 because of the presence of various buffers. We were also able to show a significantly (P = 0.001) higher pCO2 levels in samples drawn after 2h compared to those taken before 2h, further proving that significant hypocapnia was present in samples taken just after FS episode, which then normalized with time and may have been a trigger for seizure activity. In the study by Schuchmann et al., they compared patients with gastroenteritis and patients who had FS. Respiratory alkalosis was found in children with FS (pH, 7.46±0.04; pCO2, 29.5±5.5mm Hg), whereas metabolic acidosis was seen in children with gastroenteritis (pH, 7.31±0.03; PCO2, 37.7±4.3mm Hg; P < 0.001 for both parameters). So, the statistically significant difference may be attributed to the fact that children with gastroenteritis are as it is predisposed to metabolic acidosis because of bicarbonate losses in stool. Kilicaslan et al. compared children with FS and children who presented with a febrile illness without seizures and found no significant difference in mean blood pH between FS and control groups but blood pCO2 was significantly lower in FS group. However, it is a possibility that some children, especially the ones with FS, may be more genetically predisposed to hyperventilation and thus respiratory alkalosis compared to those who do not have FS. So, in our study, we compared the acid–base status of children presenting within 2h and after 2h of seizure episode but found results similar to the ones found in the study by Kilicaslan et al. Results of comparison of acid–base status in simple and complex FS group were contradictory in previous studies. In a study by Kilicaslan et al., complex FS group exhibited significantly lower pCO2 levels than patients with simple FS, which was not shown in the study conducted by Schuchmann et al. In our study, the mean pH and pCO2 in children with simple FS and complex FS group was 7.41±0.04 and 7.43±0.03 and 27.78±5.56 and 28.84±3.85, respectively. No statistically significant difference was found (P = 0.222 and P = 0.633, respectively). Our findings are in accordance with previous animal studies showing any changes in blood pH and pCO2 levels increase or decrease neuronal excitability. These studies concluded that fall in pCO2 increases neuronal excitability of postsynaptic cells without altering neurotransmitter release in anesthetized rats. It was further shown that hypocapnia increases spike trigger in hippocampus in both the in situ and in vitro population., Schuchmann et al., in 2006, using an animal model of experimental FS showed the same that hyperthermia caused respiratory alkalosis with consequent brain alkalosis and seizures. Seizures and epilepsy have been observed in children with systemic alkalosis of various origins. Takahashi et al., in 2005, showed activation procedures such as hyperventilation induces epileptiform discharges in EEG among susceptible children. In contrast to this, a fall in brain pH is known to suppress neuronal excitability and epileptiform activity., It is important to note that the overall effect on acid–base equilibrium depends on the change in respiratory rate that controls the net flux of CO2 and on the kidneys that control the excretion of bicarbonates. Benzodiazepines are standard immediate treatment for the management of patient with febrile status epilepticus,, and were used similarly in our study subjects. They have broad spectrum of side effects such as hypotension, sedation, decreased alertness, and depressed respiratory effort in young child, which limits its clinical use. To overcome these therapeutic limitations, newer and safer treatment modalities are needed. CO2 has been long recognized for its anticonvulsant properties. Animal studies where rat pups were exposed to 5% ambient CO2 suppressed the experimental FS with a delay of only 20s. In a pilot trial carried out in seven patients, a rapid termination of electrographic seizures was seen. This study concludes that FS may be associated with respiratory alkalosis and might be one of the precipitating factors in genetically susceptible children. This study design has inherent limitations that FS occurs mainly at home, hence there is only access to postictal data, and crucial period of acid–base derangement during pre-ictal phase or ictal phase is difficult to study. Another limitation of this study was a small sample size, especially those children who are presenting to the emergency unit within 2h. Although these data are insufficient to show strict causal relationship between hypocapnia and FS, they give sufficient background knowledge to design for subsequent clinical trials and novel therapies aimed at suppressing FS. Verity CM, Golding J. Risk of epilepsy after febrile convulsions: a national cohort study. BMJ 1991;303: 1373-6. Balestrino M, Somjen GG. Concentration of carbon dioxide, interstitial pH and synaptic transmission in hippocampal formation of the rat. J Physiol 1988;396:247-66. Helmy MM, Tolner EA, Vanhatalo S, Voipio J, Kaila K. Brain alkalosis causes birth asphyxia seizures, suggesting therapeutic strategy. Ann Neurol 2011;69:493-500. Caspers H, Speckmann EJ. Cerebral pO2, pCO2 and pH: changes during convulsive activity and their significance for spontaneous arrest of seizures. Epilepsia 1972;13: 699-725. Schuchmann S, Schmitz D, Rivera C, Vanhatalo S, Salmen B, Mackie K, et al. Experimental febrile seizures are precipitated by a hyperthermia-induced respiratory alkalosis. Nat Med 2006;12:817-23. Tolner EA, Hochman DW, Hassinen P, Otáhal J, Gaily E, Haglund MM, et al. Five percent co2 is a potent, fast-acting inhalation anticonvulsant. Epilepsia 2011;52:104-14. Kilicaslan B, Erol I, Ozkale Y, Saygi S, Sariturk C. Association between hypocapnia and febrile seizures. J Child Neurol 2014;29:599-602. Longmore M, Wilkinson I, Turmezei T, Chung CK. Oxford handbook of clinical medicine. 7th ed. Oxford, UK: Oxford University Press;2007. O’Dempsey TJ, Laurence BE, McArdle TF, Todd JE, Lamont AC, Greenwood BM. The effect of temperature reduction on respiratory rate in febrile illnesses. Arch Dis Child 1993;68:492-5. Schuchmann S, Hauck S, Henning S, Grüters-Kieslich A, Vanhatalo S, Schmitz D, et al. Respiratory alkalosis in children with febrile seizures. Epilepsia 2011;52:1949-55. Takahashi T. Activation methods. In: Niedermeyer E, Lopes da Silva FH, editors. Electroencephalography. Philadelphia: Lippincott Williams & Wilkins; 2005. pp. 281-303. Sadleir LG, Scheffer IE. “Febrile seizures” BMJ (Clinical research ed.) 2007;334, 7588:307-11. McIntyre J, Robertson S, Norris E, Appleton R, Whitehouse WP, Phillips B, et al. Safety and efficacy of buccal midazolam versus rectal diazepam for emergency treatment of seizures in children: a randomised controlled trial. Lancet 2005;366:205-10.